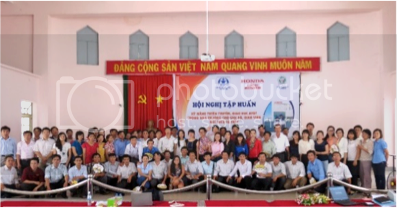 This month we increased our efforts to build capacity among journalists and policy-makers in Vietnam. 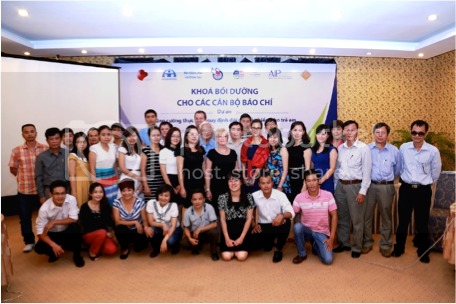 With support from the Global Road Safety Partnership (GRSP), we organized training courses for journalists and policy-makers in Ho Chi Minh City and Hanoi to equip them with the skills necessary to spread awareness of the issues of road safety and child helmet use in Vietnam. The effects of these workshops are already being seen as local authorities organize helmet and road safety trainings of their own at the provincial level. At the end of October, the UN Secretary General highlighted the work of the Cambodia Helmet Vaccine Initiative in his report Improving global road safety for its efforts to endorse the joint statement "Motorcycle passengers, including children, must wear helmets." The statement, which was signed by over 100 stakeholders and submitted to the Minister of Transport in January 2013, appealed to the Government of Cambodia to approve the draft passenger helmet law, the national road safety policy and 10-year action plan, and the three-year helmet action plan. The report was released in anticipation of the UN General Assembly session this fall and the UN Road Safety Collaboration's bi-annual meeting which I will be attending in Abu Dhabi this week. 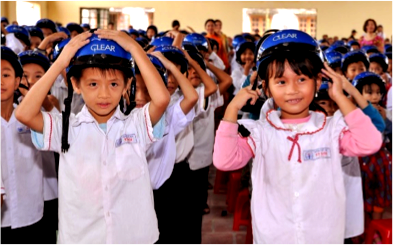 On October 1st, 2013, CLEAR and AIP Foundation held a helmet handover ceremony for the pilot project Helmets for Heads in Tu Ky district of Hai Duong province. 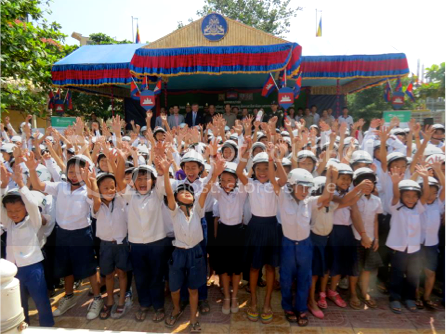 On this day, 1,065 helmets were donated to 505 elementary students, 505 mothers, and 55 teachers from Ky Son and Tai Son primary schools. Prior to the helmet handover, a training on basic road traffic laws and helmet use was organized for parents and teachers at the school on September 28th. The helmet handover ceremony included performances by students, parents, and teachers as well as helmet training games, and remarks by the Department of Education and Training. The Helmets for Heads project is the result of a partnership that began in 2012 between CLEAR and the Road Safety Fund as part of the UN Decade of Action for Road Safety. View the photos here and read the press release here. 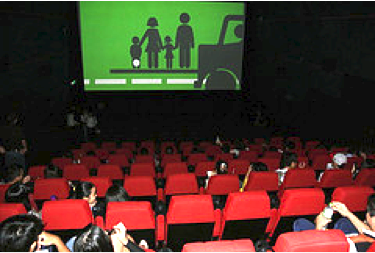 "Let's Walk Safely," a pedestrian safety TV commercial created by the Asia Injury Prevention (AIP) Foundation and CreaTV will air in CJ Group owned MegaStar Cinemas across Vietnam this October, November, and March. The commercial will provide movie-goers with valuable pedestrian safety information that has the potential to save thousands of lives across the nation. The TV commercial was created as a pro-bono project by CreaTV to support the UN Decade of Action for Road Safety as part of AIP Foundation's child pedestrian safety campaign. This multifaceted program combines education, research, and enforcement with environmental improvements to areas where children walk with the goal of promoting safe habits among child pedestrians. The brief but moving commercial targets young audiences with striking animation and encourages them to stop, look both ways, think, listen, and cross carefully. CJ Group and MegaStar have generously agreed to air the commercial in ten of their theaters more than 9,000 times in five provinces throughout Vietnam. Watch the commercial here, check out photos here, and read the press release here. At the beginning of the 2013-2014 academic year, Johnson & Johnson returned to Ha Tinh, Quang Binh, and Dong Nai provinces for helmet top-offs and extracurricular activities as part of the Helmets for Kids program. During these top-offs, Johnson & Johnson donated 3,848 helmets to all first graders and other students of target schools whose previously received helmets were damaged. Together, Johnson & Johnson and AIP Foundation have donated 21,476 helmets to 32 schools in two years of Helmets for Kids partnership. During the 2012-2013 school year, helmet use rates at these schools increased from 26 to 96 percent. A total of 35 crash cases were collected, and all of the students and one teacher that were involved in road traffic crashes were protected thanks to the helmets they received as a donation. 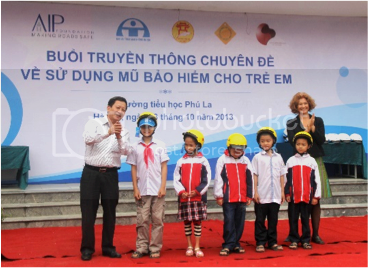 From October 3rd-4th, 2013, the Asia Injury Prevention (AIP) Foundation's Vietnam National Child Helmet Campaign "Children also need a helmet" organized a road safety training course for policy-makers at the Golden Lotus Hotel in Ha Noi. The aim of the course was to expand participants' knowledge of issues surrounding road safety and helmet use and generate concrete action plans to promote child helmet wearing. Trainings covered current helmet legislation and challenges to implementation, technical standards and requirements of helmets along with brain injury data, development of child helmet campaigns, and effective behavior change methodologies. The workshop was supported by the Global Road Safety Partnership (GRSP), with financial assistance from the Bloomberg Philanthropies. The two-day workshop resulted in the development of six provincial action plans that outlined a combined campaign with police enforcement and communications activities to promote child helmet wearing. The course materials are available online through the campaign's website. Follow-up will be conducted via an online forum hosted on the "Children also need a helmet" website. From October 5th-6th, the Danang Traffic Safety Committee and Da Nang Women's Union, in collaboration with AIP Foundation conducted two "Helmets as companions for kids" contests for families with children under the age of 16 in the Nhon Hoa and Hoa Phu wards of the Hoa Vang district of Danang . More than 220 families joined the two contests featuring road safety and helmet use knowledge tests for children. The board of organizers also handed out 140 quality helmets to children whose families could not afford to buy them. 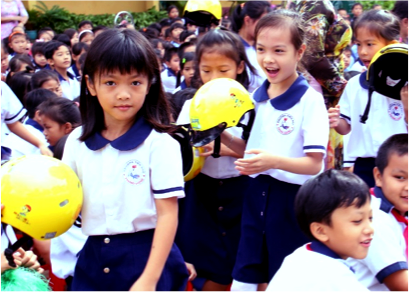 The "Helmets as companions for kids" contests are the result of one of two small grants given by AIP Foundation to local authorities in Danang in order to support their efforts to increase child helmet use. On October 9th, FedEx Express, the world's largest express transportation company and a subsidiary of FedEx Corp. marked International Walk to School Day by launching new Safe Kids Walk This Way (WTW) initiatives and revealing findings from the first-ever pedestrian safety study in Vietnam. Held in partnership with Safe Kids Worldwide, WTW is a road safety advocacy program that aims to educate children about safe walking behaviors and increase awareness about pedestrian welfare. This year's WTW Vietnam program will kick off with a photo contest for secondary students nationwide that will capture examples of safe and dangerous road user behaviors. The contest will run from November 2013 to April 2014, and will culminate with an exhibit in Hanoi featuring the winning photo entries in May 2014. A workshop series called the Walk with FedEx Tour will begin in November to bring pedestrian safety education and equipment to 13,000 students in primary schools throughout Ho Chi Minh City. Check out the photos here and read the press release here. From October 9th-11th, the Asia Injury Prevention (AIP) Foundation's Vietnam National Child Helmet Campaign "Children also need a helmet", supported by the Global Road Safety Partnership (GRSP), organized a training workshop for journalists and reporters to increase their knowledge of the issues of road safety and child helmet use. 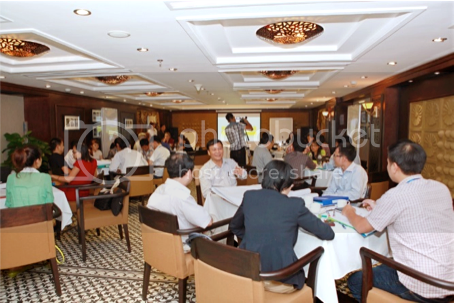 The three-day workshop was held at the Silver Creek City Resort in Ho Chi Minh City. The workshop was developed by AIP Foundation to build capacity among members of the media by providing background on the global crisis of road injuries and fatalities, disseminating information about helmet regulations and the level of helmet use among adults and children in Vietnam, and sharing best practices for increasing awareness of road safety issues from journalists around the world. Activities were organized to enable journalists and reporters to maximize their publications' roles in road safety behavior change communications. Trainings covered the issues of child helmet use from many angles. Talks were given by parents of survivors of road crashes, a doctor specializing in traumatic brain injury, a police officer, a headmaster, a helmet manufacturer and the creator of the award-winning road safety documentary "In Retrospect". Writing workshops and communications strategy sessions were held, and participants were invited to join a forum hosted on the AIP Foundation's child helmet website where journalists can post and discuss articles covering road safety and helmet use. The workshop was funded by GRSP, with financial assistance from the Bloomberg Philanthropies. Read the press release here and check out the photos here. On October 26th, the Dong Nai Department of Education and Training (DoET) organized a two-day training workshop for 262 teachers on road safety education that included a seminar on child helmet use. The workshop was organized as a result of the Dong Nai DoET's participation in AIP Foundation's policy-maker training course. The seminar included presentations on the level of child helmet use nationwide, challenges and barriers to helmet wearing, as well as proven solutions and measures to increase child helmet use. The teachers actively participated in discussions on effective educational and communication activities that schools and teachers can conduct in order to inspire behavior change among secondary and high school students and their parents. The model for improving student helmet wearing rates, the child helmet-related resources and suggested educational helmet use activities provided in this seminar were highly appreciated by the participants. Plans are underway for Dong Nai DoET to organize another training workshop on child helmet use for over 500 kindergarten and primary teachers. 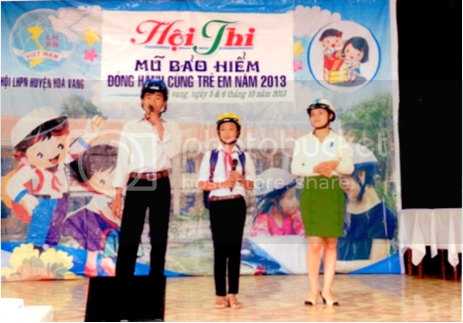 On October 28th and 30th, the Hanoi Traffic Safety Committee, Department of Education and Training, and AIP Foundation held two district-level parent information sessions about child helmet use in Phu La and Thang Long primary schools. The kick-off session at Phu La primary school in the Ha Dong district of Hanoi had 5,000 parents in attendance. Parents received training on the importance of child helmet use, how to create good helmet use habits, proper helmet wearing, and how to keep helmets clean and in good quality. One more district-based information session will be held on November 4th in Hanoi and all the remaining primary schools in the five target districts will organize similar information sessions using the district-based model. The information sessions were organized as part of phase III of the "Children also need a helmet" public awareness campaign. There will be 20 parent information sessions in Da Nang and 35 in Ho Chi Minh City during the month of November. The Asia Injury Prevention (AIP) Foundation, in partnership with the National Road Safety Committee and the General Commissariat of the National Police, launched the new Safe Roads website on September 20, 2013. The website expands on AIP Foundation Cambodia's successful community engagement through Facebook over the last year. Several initiatives, including a photography contest, an online petition, and a family-friendly app, have already garnered the page nearly 10,000 fans. To build on this online following, the new Safe Roads website will target Cambodian youth with information on the national road safety situation, up-to-date news plus weekly quizzes games, and prizes. Read the press release here and view the site here . On October 24th, the leading Canadian-based financial services company, Manulife PLC, in its second year of collaboration with the Asia Injury Prevention (AIP) Foundation, held a Helmets for Families helmet handover ceremony at Wat Preah Put primary school in Phnom Penh.On this day, 647 helmets were donated to students, teachers, and parents to promote road safety and to raise awareness around the issue of helmet use. Wat Preah Put primary school is located in a high-density traffic area along a main road in Phnom Penh. Approximately 80 percent of students commute to and from school during rush hour on motorcycles and bicycles, very few of whom wear helmets. With this donation, Helmets for Families has provided helmets to 499 students, 48 teachers, and 100 mothers as well as helmet training sessions to reinforce the importance of helmet use and remind parents and educators of their responsibility to act as models of good behavior. Prior to the handover ceremony, AIP Foundation and Manulife organized a teacher training on October 17th. At the training, a total of 39 teachers received instruction on helmet use and road safety. The importance of helmet use was conveyed with the aid of statistics from Cambodia's Road Crash Victim and Information System (RCVIS) and teachers sharing their personal stories of involvement in road crashes. The three steps of correct helmet use and effective teaching methods for maximum student engagement were also covered. The training resulted in teachers collaborating to form plans for educating and engaging their students with helmet use and road safety activities. Read the press release here and view the photos here.